So it wasn’t the storm of the century that the news media [and Mayor DeBlasio] made it out to be, but Juno deposited a fair amount of snow on my town overnight. 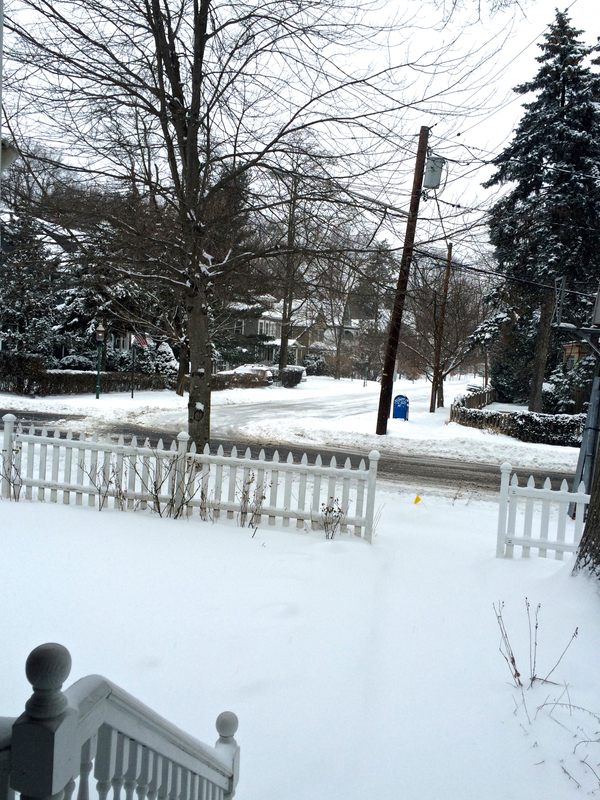 Thanks to the two-man team of Paul, my husband, armed with a shovel, and Nick, our neighbor, the proud owner of a brand new snowblower, our porch, front walk and driveway were clean and passable by mid-morning. Cookies usually do the job, unless you’re trying to thank a diabetic and his Weight Watchers-following wife. I refuse to bake with Splenda, so I had to think of something else. I had time, bread flour, and also needed to make dinner for Paul and myself this evening, so I decided to make pizza. I’ve been conducting experiments making homemade pizza dough over the past few weeks. My first experiment was Whole Wheat Pizza Dough, which while much easier than I expected was a little too crisp and bland for my liking. Today I made pizza dough using a recipe from Carol Field’s The Italian Baker. This is a great book for anyone who has moved beyond beginner-level cooking but still appreciates a simple, straightforward approach to baking both sweet and savory treats. Also, if you have a bunch of cooking toys like I do (such as a stand mixer and food processor), you’ll love how Ms. Field provides options for preparation. She tells you exactly how to mix and work with pizza dough by hand, with a mixer, and with a food processor. I’m a novice with dough, so I went with the easiest method: pizza dough by food processor. I made one adjustment to Ms. Field’s pizza recipe and elected to use bread flour instead of all-purpose flour. I had a huge bag of bread flour in the house, so I figured I might as well give it a shot. I chose wisely. The crust of this pizza baked up golden brown and crisp, with the kind of giant air bubbles you usually see on restaurant pizzas. So light and airy, but still with enough structure and strength to support sauce and cheese. Bonus: the recipe yields enough dough for two pizzas, potentially 3 depending on the size of the pan you use. I made a Margherita pizza for Nick and Wendy, one for Paul and I, and then I made third irregularly shaped pizza with leftover roasted fennel, Parmegiano Reggiano and mozzarella. Combine yeast, warm water and sugar in a measuring cup. Stir and set aside for 5 minutes, until a little foamy. Add flour and salt to processor mixer bowl, and pulse a few times to mix. Turn the processor on and pour in the following through the spout in this order: yeast/sugar/water mixture, olive oil, and cold water. Continue mixing until a mass of dough forms and starts pulling away from the edges. Turn the processor off and remove the dough. Knead gently by hand until dough is soft and shiny. Then rub about a teaspoon of olive oil on your hands before gently rubbing the outside of the dough ball. Place the dough in a glass or aluminum mixing bowl and cover with plastic wrap. Cover with a dish towel and place the bowl in a warm, dry place. All of our radiators have covers (basically turning them into benches), so I placed the bowl on a radiator. Then find something to do for the next hour (or two, in case you have to go run errands). When you get back to the dough, it should be roughly twice the size of when you last saw it. Remove it from the bowl and place on a cutting board or marble slab. Now, if you want to refrigerate or freeze the dough, this is the time to divide, wrap and freeze (or refrigerate). If you intend to make pizza in the very immediate future, knead the dough gently for about a minute and then put it back in the bowl and cover as before. Back to the warm, dry resting place it goes—for another 30-45 minutes. By this point the dough will have grown to a lighter and somewhat puffier mass. Remove from the bowl and divide the dough into two halves. Sprinkle flour on your cutting board. Shape the first half into a ball and then flatten with your hand into a disk onto the board, then sprinkle the top with flour. Get your trusty rolling pin and, rolling out from the center, roll the dough into a flat circle about 1/4 of an inch thick. You’ll see air bubbles, and using the rolling pin will help to eliminate the excess air. Carefully peel the dough off the board and lay it on your crisper pan with a 2-inch overhang, so you can crimp the edges. Cover the dough with plastic wrap and set aside. Pre-heat your oven to 400 degrees. After the dough has rested 15 minutes, and the oven has reached temperature, apply your toppings. Go light – more toppings means more weight, which means a pizza devoid of structural integrity. You don’t want that. I used a 14oz can of Hunt’s Fire Roasted Tomatoes (enough to spread on 2 pizzas) and seasoned with generously sprinkles of oregano, garlic powder, red pepper, black pepper and kosher salt. I put the pizza in the oven and set the timer for 14 minutes. Wait a minute, you’re thinking. You put the pizza in the oven without cheese? Whaa? Yes. This is critical. If you want melted soft bubbly cheese—not dry, brown, leathery cheese—you have to put it on near the end of baking. So when the 14 minutes are up, take the pizza out of the oven, admire how beautiful and airy and golden your crust is, and apply thinly sliced cheese, which will start melting immediately. Put the pizza right back in the oven and set the timer for 5 minutes. When the timer goes off, remove the pizza and add some chopped fresh basil. Let it rest 3-5 minutes, then cut and serve. Repeat with the other half of the dough. 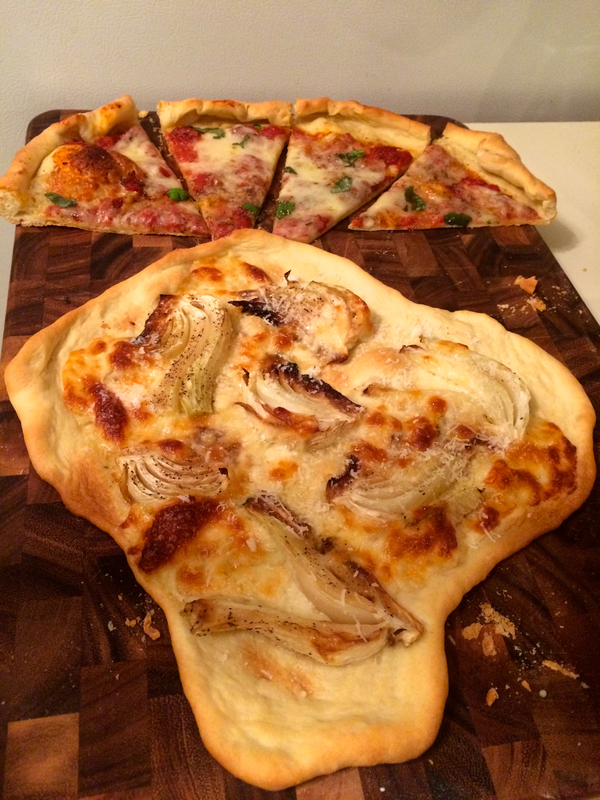 As I mentioned, I had enough extra dough to make a third, albeit irregularly shaped pizza. Having run out of tomatoes and basil, I improvised and topped this one with roasted fennel, mozzarella and grated Parmegiano Reggiano. Dee-licious! Working with room temperature dough makes for easier kneading, shaping and rolling. Cold dough isn’t very pliable. 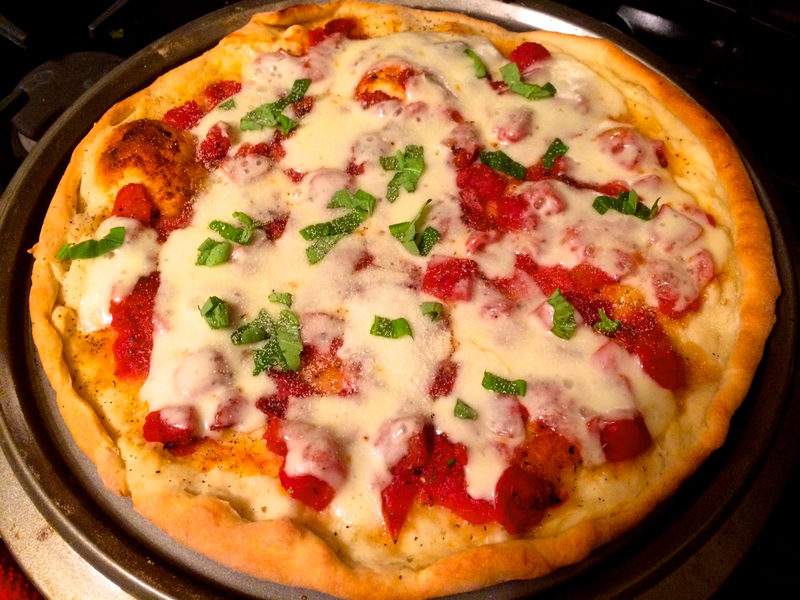 This entry was posted in Uncategorized and tagged bread flour, carol field, crisp crust, dinner, dough, easy, food processor, homemade pizza, italian baker, recipe on January 28, 2015 by jennyinthekitchn. Make a steak on the austerity plan? Don’t mind if I do.